Women of Power: What Mask Are You Wearing? We wear masks. Many would likely hate to admit this, but often times throughout the course of our professional and personal lives, even in the course of a day, masks are worn to accommodate, adapt, and perhaps even survive. The ‘need’ for a mask at any given time may incite debate. Some would argue ‘be yourself at all times, at any cost,’ while others may lean toward hiding and revealing aspects of self in correspondence with circumstances and surroundings. Either way, the masks are there and at some point or another we may reach to put them on. The 2016 Black Enterprise Women of Power Summit explores the concept of the masks we wear, and how it relates to owning our truths, with The Mask Mixer and the Un-Masquerade SoirÃ©e executive leadership sessions. Facilitated by founder and executive director of The Mask Project and management professor at Florida A&M University, Dr. Atira Charles, The Mask Mixer is an opportunity to get to know yourself, your strengths, fears, and facades, through the designing and decorating of your own masks; exposing the false faces you put on in the world. Oh, and this session includes wine–cannot forget the wine. 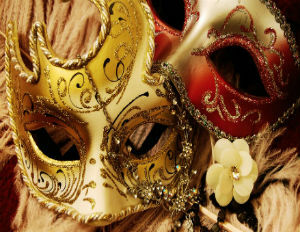 After your mask is created, you will then prepare to unmask at the Un-Masquerade Soiree hosted by President & CEO, Black Enterprise, Earl “Butchâ€ Graves, Jr. and editorial director of the Black Enterprise Women of Power Summit, Caroline Clarke. This soiree will prove to be an unforgettable journey of collective self-discovery and revelation as you engage in conversation designed to create honest, intimate, and lasting connections with your peers. The goal of the evening is for you to fully recognize and accept the power that lies in achieving your truest self. Create and lose your mask at the 2016 Black Enterprise Women of Power Summit, March 9-12, Hilton Diplomat Resort & Spa, Hollywood, Florida. Register now! For a limited time only, you may register at a special discounted holiday rate when using code Holiday16.